From Beast Kingdom. A PREVIEWS Exclusive! Beast Kingdom's EEA highly movable action figure series has launched the latest head sculpture based on Thor: Ragnarok. It is a revision from the previous more realistic style that makes the hair carving more supple and consistent with the overall shape of the figure. This revised product was launched in the 2017 Comic-Con International: San Diego (SDCC) and received high praises from the public. 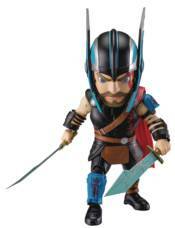 The second creation is the Gladiator Thor! Thor's armor and weapons during his battle against the Hulk in the arena are meticulously reproduced according to the movie. The helmet, armor, and dual swords are modeled based on the official specifications. The professional hand-painting makes Thor even more courageous and lifelike.